(Newser) – An Alaska man who poached three moose and left most of the meat to rot has been sentenced to nine months in jail and fined more than $100,000, the AP reports. Rusty Counts, 39, of Anchor Point, shot the moose near his community over two weeks in September. He pleaded guilty Nov. 6 to 21 misdemeanor wildlife counts and violations, including wanton waste, exceeding bag limits, and contributing to the delinquency of a minor (his nephew, who was with him). 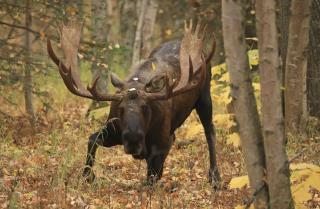 Hunting regulations near the Kenai Peninsula community require moose to have antlers measuring 50-inches wide to be harvested. None of the three moose had the required spread, says prosecutor Aaron Peterson. "The working theory is that he realized they were sublegal and decided not to stick around to salvage the meat," Peterson said Monday. 3 months per moose...sounds fair. Gee, imagine how many a man could feed were he not behind bars for most of lost year.